Pacific Northwest garden writers pick their favorite plants. Garden writers from around the Pacific Northwest compile their top ten plants with a brief explanation why it made the list. Favorite plants? I have seasonal choice disorder: my favorites vary with weather and impulse, and even more depends on their agree-ableness with where I live. My garden sits in a section of 4th growth Douglas fir, with sunny spots cleared to show Discovery Bay. It’s windy and dry, with exposed areas; other areas are windy and shady. Parts of it tough out summer without irrigation; a few sections and the containers get precious water as needed. What’s not to like? Takes dry shade; handsome evergreen leaves with a polished shine, and that incredible honey-sweet fragrance in January. Does anyone know what insect that scent attracts? Oh, it attracts gardeners. It has soft blue-green needles and grows to 3 x 3 feet in 10 years, and not much taller in 25. It’s a perfect alternative to mugo pines. An Irish hybrid that is a bit sturdier, even, than ‘Charity’, which I also grow, as well as native Mahonia nervosa. It has stunning winter ochre flowers. Fern-leaf maple has brilliant fall color; handsome branch structure. Or it would have if the deer hadn’t gnawed through fencing, turning it into a one-sided plant. I’d have been content if the 4-footers had eaten native vine maple, which they shun in favor of this one. Epimedium x rubrum--and other bishop’s hats. The Mediterrean group thrive better in my dry woods than do the Japanese or Korean; year-round beauty from the leaves and on to faintly intriguing May flowers. Clip these in February to get rid of the torn-vinyl-seatcover look on the old leaves. Pure nostalgia, the spring flower of the Ohio woods when I was a child. Slow growing--very slow indeed from seed: purest blue, elegant leaf shapes. I’m 9 years old again when it blooms. Stands up to wind and rain, to nearly 4 feet; handsome all winter. Seed heads form late. Switch grasses (Panicum sp.) hate the southwest winds. From Brent and Becky’s Bulbs in Virginia, these have soft cream and deep pink corolla centers, with the exact scent of an old-fashioned rose. Being a daffodil nut, I also grow about 120 other varieties, but who’s counting? From Heirloom Roses, St Paul, Oregon and hybridized by David Harkness in the ‘English Legend’ series. Vigorous, deeply fragrant, elegantly shaped floribunda; the precise color of orange marmalade on a corn muffin. (Yes, I am writing this at breakfast.) No disease mess. Worth building a deer fence for. The new Orienpets excel in my garden. 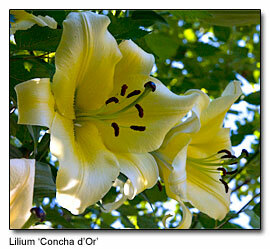 A favorite is white and gold ‘Concha d’Or’ from B and D Lilies in Port Townsend. It has the gold of the feathers on a goldfinch that perched one day. 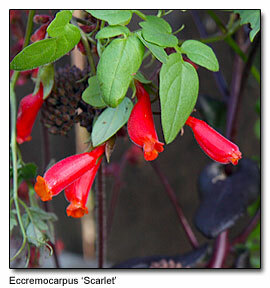 Hardy, nearly evergreen until coldest weather; small tubular orange-red flowers in June—hummingbird heaven. Mary Robson is a retired horticulture agent from Washington State University/King County Cooperative Extension. Robson wrote a column for the Seattle Times “Dig” until the newspaper retired the section. 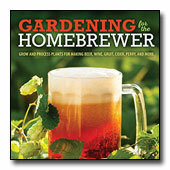 She continues to garden, write and give lectures. Lilium 'Conca d Or' from Mary Snyder's garden in Olympia, Wa. 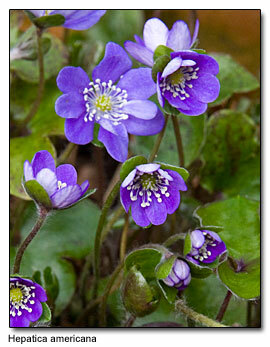 Hepatica americana from Mary Robson's garden on the Olympic Peninsula. 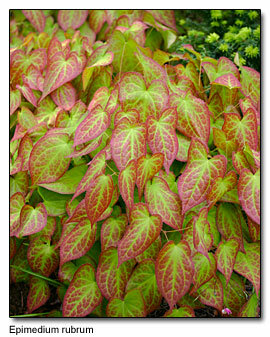 Epimedium rubrum and Ecremocarpus 'Scarlet' from Debbie Teashon's garden in Kingston, WA.